So there is this brand spanking new cupcake place in the city - a tiny bakeshop on East 7th between 1st and Ave. A, a little block that I like to call culinary heaven. Caracas Arepas, Porchetta...and now Butter Lane? The residents of East 7th are SO LUCKY! After an awesome dinner of pork and beans across the street at Porchetta (more to come on that later...) I overheard the owner recommending Butter Lane to a fellow diner. So glad I'm so good at eavesdropping! Butter Lane is all about pure ingredients, locally sourced...and most impressively - No Artificial Food Coloring! 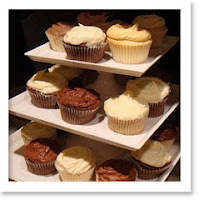 That's right, you heard it....the frosting on the cupcakes - that's the actual color nature intended! Which means...vanilla is white or cream (not pink or green) and chocolate is brown. So refreshing. Blueberry is purplish bluish...just like the real thing! French Buttercream is a labor intensive process of beating egg whites, butter and granulated sugar. Translation - lighter, fluffier (less sweet in my opinion) frosting. Now at Butter Lane you can mix and match frostings with cake - vanilla or chocolate or banana bread. Standby frostings include vanilla and chocolate, french or american buttercream - as well as cream cheese, and a daily selection of fruit frostings...anything from key lime, blueberry, raspberry...or whatever else is in season! To quench your thirst - Butter Lane also offers decadent hot chocolate from the king himself, Jacques Torres. So I'm serious...go to Butter Lane and get the French Vanilla Buttercream & chocolate cupcake - light and fluffy, it is seriously a little taste of heaven. And I know my cupcakes. This is the real deal. Magnolia should be scared. Very scared.